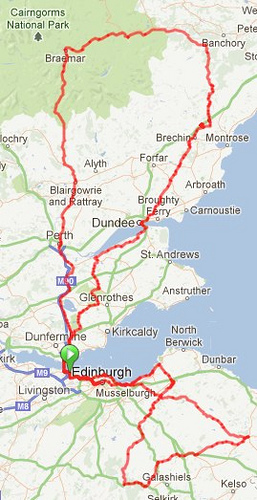 See also my 2013 Audax Ecosse interactive map! You can enter all rides now, via PayPal through the official page link, except where noted otherwise. Generally two weeks notice is required, and rides may fill up far in advance. Please let me know of any errors or omissions. I’ve bundled up all GPX traces into a zip file which you can download here. (Note that you can download the individual audax gpx traces from each entry). These may or may not be the final routes, so use with due caution! Route: From Musselburgh the ride climbs steadily inland to Gifford, then up to the high point on Redstone Rig in the Lammermuirs. Turn east, then soon north-west as the route descends sharply to the plains. Watch out for “heroic” road surfaces! 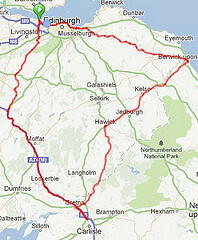 The route proceeds to Dunbar for a cafe stop, then returns fairly directly to Musselburgh (via Haddington and the coast road from Longniddry). 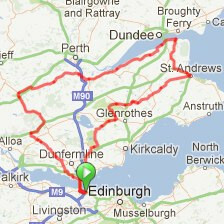 Route: From Dalmeny ride up the Forth valley, crossing to the north side on the Forth bridge, to Gleneagles via Dollar. Turn east and descend to the Tay, following the coast out past the Tay bridge to Newport. The return leg visits St Andrews and the Lomond Hills Regional Park, crossing the Forth bridge again to the finish. 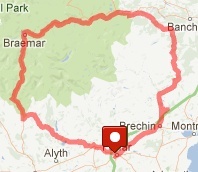 Route: New for this year… a dramatic ride through the Crawick, Mennock, and Dalveen passes. Includes a climb to the top of the Green Lowther on Scotland’s highest navigable road, before heading north on the Devil’s Beef Tub. 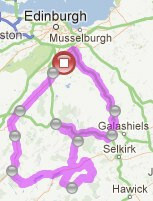 Note that due to crazy snow, this year’s route was modified to be as follows. Route: Three ferries and some wonderful west coast scenery! 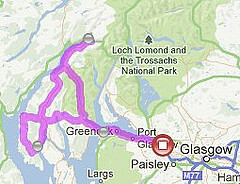 Ride south along the coast from Ballachulish village to Oban, catching the ferry to Mull. Take the long way around Mull to the Fishnish ferry, enjoying ocean views on both sides of the island. 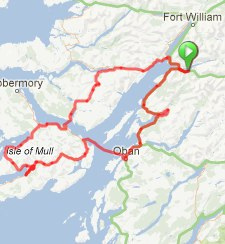 A steady climb north from Lochaline is rewarded by the screaming descent by Strontian, followed by quiet roads to the Corran ferry, and the finish. Route: South from Edinburgh through the Borders and some choice climbs, including the winch up to the border at Carter Bar. 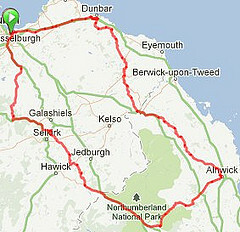 Ride through Northumberland National Park, turning for the coast and Alnwick via (more) steep bits. The return, on minor roads by Coldstream, Duns and Dunbar, is thankfully less hilly! 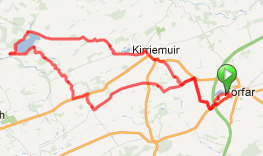 Route: A loop west from Forfar, passing through Coupar Angus, with a 50km loop on minor roads west of the A9 (crossing by Bankfoot and Dunkeld). Route: An easy run up to Kirrie, round Lintrathen Loch, with a break at Peel Farm, then back on some hillier roads via Airlie and Drumgley. 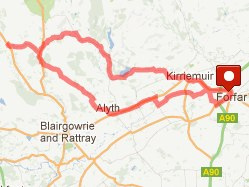 Route: A loop from Forfar to Kirkmichael, outbound via Alyth and by Lintrathen Loch on the return. 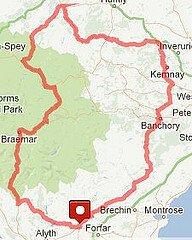 Route: A loop from Forfar through Braemar and Ballater, passing over the mighty Glenshee and Cairn O’Mount climbs. 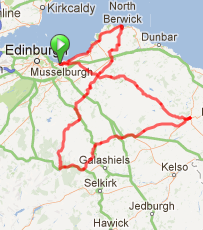 Route: Getting the miles in… ride around almost the whole of southeast Scotland with controls at Carlisle and Berwick! Route: A classic route round the central highlands, featuring the mouthwatering attractions of the Cairn o’Mount, the Cabrach, the Lecht, and Cairnwell, with 4800m of climbing fun. Route: Promising to be a full epic, this ride combines the classic Deeside Loop and Erit Lass routes to create an audax fusion spanning two hilly ranges: the Cairngorms and Lammermuirs. Lots of AAA points up for grabs, and the figure-of-eight route layout means a return to the start/finish controls for a sleep stop and replenishment. Surely a highlight of 2013! 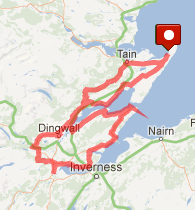 Route: A particularly flat ride; from Portmahomack down and around the Black Isle. 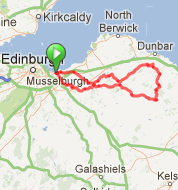 Route: A challenging route through East Lothian and over the Lammermuirs. Only 100km but a respectable 1600m of ascent makes this a ride to wake up your legs! 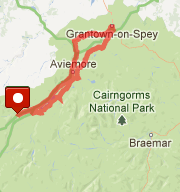 Route: A loop from Newtonmore to the coast, taking in Nairn, Forres, and Grantown. Doesn’t involve riding on the A9! 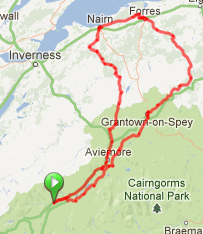 Route: A cut-down version of the Forres Foray, offering a shorter option up to Grantown and back. Route: A tough challenge on largely deserted roads in the Borders and East Lothian – the first flat leg to North Berwick is just to lull you into a false sense of security! The route then turns inland for stiff climbs to Innerleithen, more between Innerleithen and Duns, all capped by a transit of the Lammermuirs to finish. Watch out for the ford! 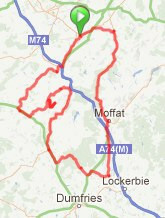 Route: From Rosewell ride south on gently rolling road to the start of the hilly section at Tweedsmuir. The next 70km includes four significant valley-to-valley climbs: Talla, Berry Bush, Witchy Knowe and Paddock Slack. Excellent for stretching the legs! A quick visit to Peebles is followed by a main-road blast down to the pub at Clovenfords then return via the A7. Hi Dave , our Club Audax , is new on the Calendar this year , 25th August ; Four Passes -200 km route , and Covenanters Trail – 100km route . Both start and finish at the Royal Albert Cycling Club ,Club Hut in Larkhall , Lanarkshire .